Task: Modernise a filling line using industrial robots to process, inspect and palletise beer kegs. In order to meet demand, the line at the Haacht Brewery in Boortmeerbeek, Belgium, needed to be capable of processing 500 kegs an hour. Solution: To use a FANUC R-2000iB robot connected to FANUC iRVision via the robot controller to visually inspect the kegs. 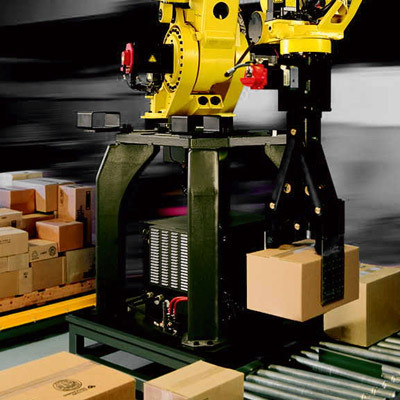 Install two FANUC M-410 robots at the end of the line to palletise the filled kegs. The solution was developed by Lambrechts Konstruktie, a manufacturer of specialised machinery for filling kegs with beer. Result: The line has been operating reliably since 2010. Flexibility and productivity have increased significantly. Maintenance costs have proved to be much lower than for a conventional palletisation solution. The Haacht Brewery in Boortmeerbeek, Belgium, has a filling line capable of processing 500 kegs an hour to ensure that more than 5000 cafés and catering establishments are supplied on time. The FANUC robots are responsible for processing, inspecting and palletising the kegs. The Haacht Brewery is the third largest brewery in Belgium with an annual production of around a million hectolitres (21 million imperial gallons). One consequence of this focus on the catering sector is that a large part of the beer production is distributed in kegs, which prompted modernisation of the filling line several years ago. The Haacht Brewery turned to Lambrechts Konstruktie a manufacturer of specialised machinery for filling kegs with beer – a niche which only a few other companies in the world also serve. Filling kegs is actually more complex than it would appear at first sight, especially as the filling must be performed in such a way that the beer does not foam and above all because the kegs on the production line must be cleaned and sterilised before filling. Overall this completely automated production line has around fifty controls ensuring that all individual operations are performed in line with requirements. The first of these controls is a visual inspection of the kegs, which are placed on the production line by a FANUC type R-2000iB robot. “A camera located above the pallet supply line detects the kegs and transmits this data to the robot,” explains Filip Beyens, Managing Director of Lambrechts Konstruktie. “The robot has two grabs that enable it to lift two kegs simultaneously. The program for inspecting the kegs with a vision system was developed by Lambrechts and is also runs in the robot controller. All required communication is conducted within the system. Of course, the operators can also view the images on the robot console but the evaluation is actually performed automatically by the robot controller. At the end of the line, when the kegs have been filled, labelled and checked one last time, two FANUC M-410 robots are waiting to palletise them. These robots are located so that they can both place the kegs on the pallets. However, in normal operation, one robot takes care of the finished kegs while the other places the kegs from the reject line on separate pallets. It was a conscious decision to install the smallest robot at the start of the line and the two larger ones at the other end. A simulation had shown that this configuration resulted in the greatest availability and maximum efficiency. The complete package with robots, controller, vision system and simulation software was a persuasive argument for Lambrechts to select FANUC for this type of application. The basis of the successful partnership between the Haacht Brewery and Lambrechts Konstruktie is good communication.